An Indianapolis woman is upset with the way the city's animal care service disposed of her dog after the animal was hit by a car. INDIANAPOLIS — A dog owner is upset with the way Indianapolis Animal Care Services disposed of her pet after it was hit and killed by a car. Taylor Perez was on vacation in Mexico when she got the sad news that her dog, Yayo, was struck and killed last week. Perez's sister was walking Yayo when the dog got off his leash. 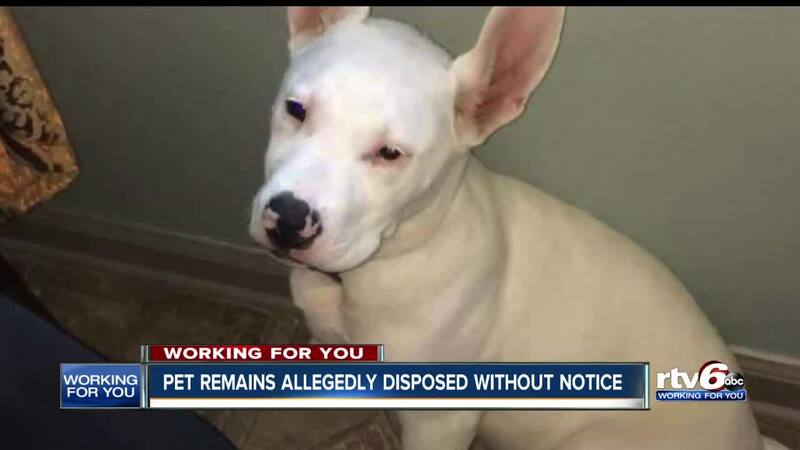 Perez claims her dog's body was taken by Indianapolis Animal Care and Control for investigation. "The gentleman that's in charge of handling the disposal of bodies, he basically told me that they threw him away in the city dump," she said. She had already made plans to have Yayo cremated so his ashes would remain with the family. "What I want is honestly for my dog back," Perez said. "But they just keep telling me it's impossible. I mean I'm not physically there to be able to go dig through the trash for his body." RTV 6 has reached out to Indianapolis Animal Care Services to verify the accuracy of the claims Perez is making. This story will be updated when the city issues a response.